ABSOLUTELY PERFECT IN EVERY WAY! This is a fully equipped, not-dogged-out, almost new RAPTOR! You can't find them this nice used anywhere! This one has the 802A equipment package ($9,355 package including all the high-end, offroad, and luxury options), the Raptor Technology package, bed step, twin panel moonroof, Bang & Olufson premium sound, Navigation, Sync 3.0, and MUCH MUCH MORE! With amenities and luxuries befitting a modern day king, this splendorous coach reigns supreme. Simply put, this Four Wheel Drive is engineered with higher standards. Enjoy improved steering, superior acceleration, and increased stability and safety while driving this 4WD Ford F-150 Raptor SuperCrew. This is the one. Just what you've been looking for. There are many vehicles on the market but if you are looking for a vehicle that will perform as good as it looks then this Ford F-150 Raptor 4WD SuperCrew 5.5' Box is the one! This outstanding example of a 2018 Kia Optima EX Auto is offered by La Grange Toyota. The greater your fuel-efficiency, the less your carbon footprint. And with exceptional MPGs, this Kia Optima treads ever so lightly on Mother Earth. You've found the one you've been looking for. Your dream car. The quintessential Kia -- This Kia Optima EX Auto speaks volumes about its owner, about uncompromising individuality, a passion for driving and standards far above the ordinary. This is the one. Just what you've been looking for. Contact La Grange Toyota today for information on dozens of vehicles like this 2018 Kia Soul Base Auto. Just what you've been looking for. With quality in mind, this vehicle is the perfect addition to take home. There are many vehicles on the market but if you are looking for a vehicle that will perform as good as it looks then this Kia Soul Base Auto is the one! There is no reason why you shouldn't buy this Kia Soul Base Auto. It is incomparable for the price and quality. This is about the time when you're saying it is too good to be true, and let us be the one's to tell you, it is absolutely true. La Grange Toyota is honored to present a wonderful example of pure vehicle design... this 2018 Toyota Camry SE Auto only has 25,963mi on it and could potentially be the vehicle of your dreams! The greater your fuel-efficiency, the less your carbon footprint. And with exceptional MPGs, this Toyota Camry treads ever so lightly on Mother Earth. This Super White Toyota is clean and shiny exterior makes it look like it came straight from the factory. Look no further, you have found exactly what you've been looking for. There are many vehicles on the market but if you are looking for a vehicle that will perform as good as it looks then this Toyota Camry SE Auto is the one! La Grange Toyota is honored to present a wonderful example of pure vehicle design... this 2018 Toyota Camry Hybrid SE CVT only has 17,783mi on it and could potentially be the vehicle of your dreams! The impressive Toyota fuel-efficiency will make you quickly realize what you've been missing out on in life. It's noteworthy fuel economy and minimal emissions make this vehicle's value a cut above the rest. This is about the time when you're saying it is too good to be true, and let us be the one's to tell you, it is absolutely true. You could keep looking, but why? You've found the perfect vehicle right here. Just what you've been looking for. With quality in mind, this vehicle is the perfect addition to take home. Check out this gently-used 2018 Toyota Corolla we recently got in. Start enjoying more time in your new ride and less time at the gas station with this 2018 Toyota Corolla. Based on the superb condition of this vehicle, along with the options and color, this Toyota Corolla SE CVT is sure to sell fast. The 2018 Toyota exterior is finished in a breathtaking Slate Metallic, while being complemented by such a gorgeous Black interior. This color combination is stunning and absolutely beautiful! Just what you've been looking for. With quality in mind, this vehicle is the perfect addition to take home. Contact La Grange Toyota today for information on dozens of vehicles like this 2018 Toyota Corolla L CVT. Why spend more money than you have to? This Toyota Corolla will help you keep the extra money you'd normally spend on gas. You've found the one you've been looking for. Your dream car. You can finally stop searching... You've found the one you've been looking for. This is the one. Just what you've been looking for. 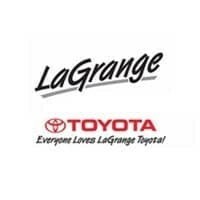 La Grange Toyota has a wide selection of exceptional pre-owned vehicles to choose from, including this 2018 Toyota Sienna. This is about the time when you're saying it is too good to be true, and let us be the one's to tell you, it is absolutely true. Look no further, you have found exactly what you've been looking for. You can finally stop searching... You've found the one you've been looking for. The Toyota Sienna LE Auto Access Seat FWD 7-Passenger will provide you with everything you have always wanted in a car -- Quality, Reliability, and Character. Check out this gently-used 2018 Toyota Tacoma we recently got in. You've found the one you've been looking for. Your dream car. There is no reason why you shouldn't buy this Toyota Tacoma SR Access Cab 6' Bed I4 4x2 AT. It is incomparable for the price and quality. The look is unmistakably Toyota, the smooth contours and cutting-edge technology of this Toyota Tacoma SR Access Cab 6' Bed I4 4x2 AT will definitely turn heads. Based on the superb condition of this vehicle, along with the options and color, this Toyota Tacoma SR Access Cab 6' Bed I4 4x2 AT is sure to sell fast. Looking for a clean, well-cared for 2017 INFINITI QX80? This is it. Want more room? Want more style? This INFINITI QX80 is the vehicle for you. This INFINITI QX80 RWD Signature Edition's level of quality is not meant for just anyone. It's meant for the person who strives for a classy, comfortable, and luxurious car. Exceptional in every sense of the word, this incredibly low mileage vehicle is one of a kind. There is no reason why you shouldn't buy this INFINITI QX80 RWD Signature Edition. It is incomparable for the price and quality.